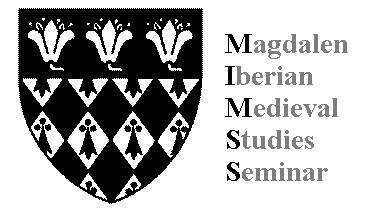 The Magdalen Iberian Medieval Studies Seminar (hereafter MIMSS) is a forum for different events and activities connected with advanced research in the field of Iberian medieval studies established in Magdalen College, Oxford. It is envisaged that it would be, from its foundation, the most important venue for research on Iberian medieval themes in Oxford, one of the most important nationally, and a highly visible one internationally. Its activities would include (but would not necessarily be restricted to) lectures, colloquia, workshops, conferences, seminars, and publications on Iberian medieval themes. These would include not only literary and linguistic topics —those most obviously related to the contents of the course of Spanish studies in Oxford—, but also topics in history, music, art, religion, history of the book, and other aspects of Iberian medieval culture. It is also important to underline that the Iberian scope that the MIMSS would adopt means that its activities would embrace not only the domain of Castilian language and culture, but also those of the Portuguese, Galician and Catalan languages and cultures. Aspects of the cultural developments associated with the Muslim presence in Medieval Iberia, as well as those connected with the Jewish minority that flourished in the Iberian Peninsula during the Middle Ages would also be present in MIMSS’ academic and research sessions. This ample array of interests and this wide scope almost automatically guarantee the interdisciplinary approach that all MIMSS activities would like to adopt, in consonance not only with the characteristics of the field of research, but also with the most innovative research contributions made internationally in recent years. Another objective of MIMSS would be to promote the interchange of ideas between scholars in the UK, Spain, other European countries, the United States, and other countries outside Europe, as well as to promote and enhance the research on Iberian culture and literature of Oxford and Magdalen faculty and students. Here you will find information about MIMSS future activities, and news related to MIMSS mission and interests. If you wish to be a member of MIMSS and be a part of the MIMSS mailing list, please send an e-mail to mimss@magd.ox.ac.uk.